From the Retro Humor collection by Vandor. Retro Humor by Ephemera I Used to Care 12 Ounce Ceramic Mug. This Item is in stock and ready to ship. You should not postpone your purchase and miss out on adding Retro Humor by Ephemera I Used to Care 12 Ounce Ceramic Mug to your Retro Humor collection! From the Retro Humor collection by Vandor. 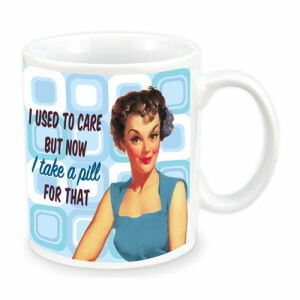 Retro Humor by Ephemera I Used to Care 12 Ounce Ceramic Mug. Mug is ceramic with photo quality design. Microwave and dishwasher safe. Ships in full color gift box.